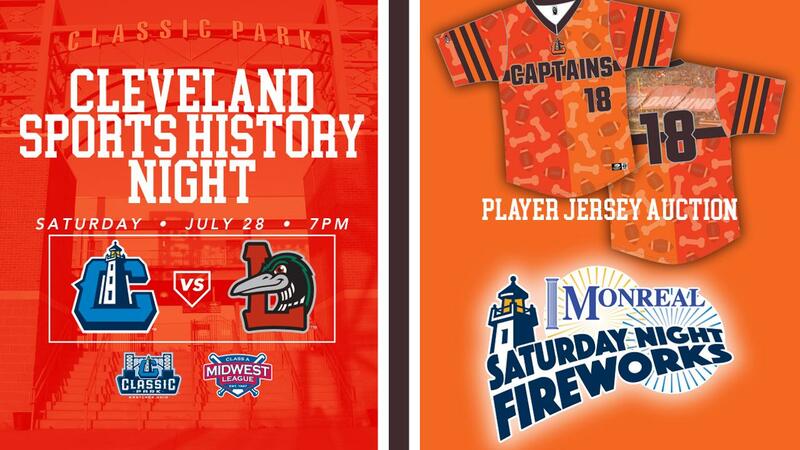 (Eastlake, OH) - The Lake County Captains, Class-A affiliate of the Cleveland Indians, are pleased to announce their VIP guest list for the 2018 Cleveland Sports History Night. Honored guests include Browns greats Hanford Dixon and Reggie Langhorne, Cavaliers greats and radio/television personalities Campy Russell and Jim Chones, legendary Indians drummer John Adams and many more. VIP's will be on hand to throw out a ceremonial first pitch and sign autographs at the game on Saturday, July 28. All guests mentioned in this release are subject to change. Hanford Dixon played his entire nine-year NFL career with the Cleveland Browns from 1981 to 1989. The cornerback was the Browns' first round pick in 1981 out of the University of Southern Mississippi and went on to earn three Pro Bowl nods (1986-88) and two All-Pro selections (1987 and 1988). Dixon has also been credited with naming the Browns' "Dawg Pound." Reggie Langhorne enjoyed a nine-year NFL career, including seven seasons with the Browns. The wide receiver out of Elizabeth City State was drafted by the Browns in the seventh round in 1985. Langhorne's best season in Cleveland came in 1988 when he caught seven touchdowns and totaled 780 receiving yards. Campy Russell played for the Cavaliers from 1974-1980 and again in 1984 as part of a nine-year NBA career. Now seen regularly as the co-host of the Cavaliers' pregame and postgame shows, Cavaliers Live, on Fox Sports Ohio, Russell's NBA tenure was highlighted by a 1979 All-Star campaign. During the 1978-79 season, Russell averaged a career-high 18.2 points per game. The Cavs' first round pick in 1974 finished his career with 8,953 points, 2,696 rebounds and 1,684 assists. Jim Chones played for the Cavs for five seasons from 1974-79 as part of an NBA career that spanned eight seasons. He also played the first and last years of his career in the ABA with the New York Nets (1972-73) and the Washington Bullets (1981-82). After averaging 8.3 rebounds per game during his professional career, Chones became a well-known figure on Cavs broadcasts. He currently serves as the radio analyst for Cavaliers basketball and has previously spent 11 seasons as the Cavs' television color analyst. Harry "Butch" Reynolds is an Akron-born Olympic Gold Medalist. The former track and field athlete competed in the 400 meter dash and held the world record for the event for 11 years. Reynolds, who also ran track at The Ohio State University, won gold as part of the 4x400 meter relay team at the 1988 Seoul Olympics and earned the silver at those same games in the individual 400 meter dash. Reynolds was part of three Gold Medal 4x400 relay teams at the World Championships (1987 in Rome, 1993 in Stuttgart and 1995 in Gothenburg). He also won individual gold in the 400 meter dash at the 1993 Indoor World Championships in Toronto. Zoltán Meskó is a former football punter who played for four seasons in the NFL with the New England Patriots, Pittsburgh Steelers and Cincinnati Bengals. Meskó's family emigrated from Romania to Twinsburg, OH when he was 12 years old. He became the top punter and placekicker in the state for Twinsburg High School and, after a collegiate career at the University of Michigan, was drafted by the Patriots in the fifth round of the 2010 NFL Draft. His In 2010, he set a rookie record for net punting yard average with New England. Hector Marinaro is the all-time leader in points and goals in professional indoor soccer. He is best remembered for lifting the Cleveland Crunch to the National Professional Soccer League championship in 1993. His game winning goal in double overtime of the deciding game against the St. Louis Ambush gave Cleveland its first professional sports championship in 30 years. Marinaro helped guide the Crunch to titles in 1996 and 1999. He now serves as the men's soccer coach at John Carroll University. John Adams keeps the beat of Progressive Field. The Indians drummer has played his bass drum in the bleacher seats at almost every Indians home game since 1973. Sir CC has been the official mascot of the Cleveland Cavaliers since 1970. He can be seen at every Cavs home game, cheering on the wine and gold. CC is also active in the community, interacting with Cavs fans across Northeast Ohio. Sully is the official mascot of the Cleveland Monsters. Sullivan C. Goal loves to pump fans up at The Q during every Monsters hockey game. Individual game tickets for all Captains games are on sale at the Classic Park box office, online at captainsbaseball.com and by phone at 440-954-WINS (9467). Information about Classic Park or the Captains can be found online at www.captainsbaseball.com and by phone at 440-954-WINS (9467). Affordable ticket packages and group party and picnic options are available now.